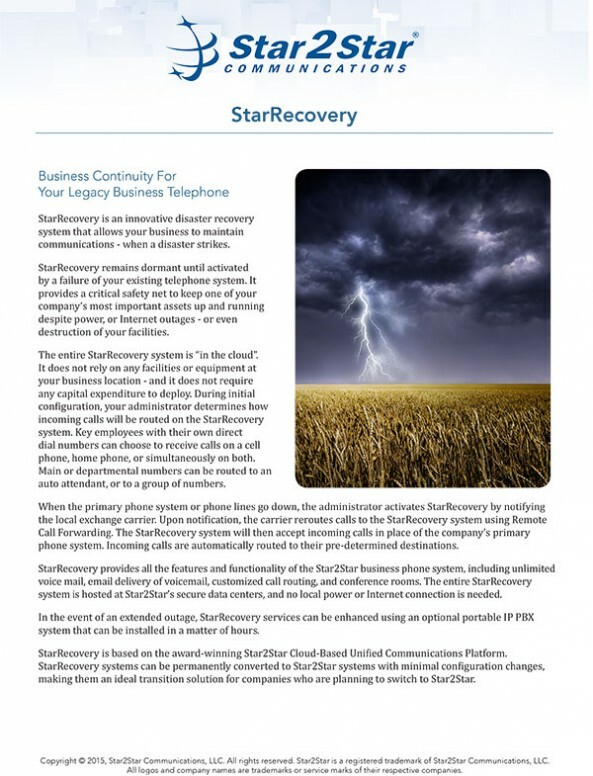 StarRecovery remains dormant until activated by a failure of your existing telephone system. It provides a critical safety net to keep one of your company’s most important assets up and running despite power, or Internet outages - or even destruction of your facilities. The entire StarRecovery system is “in the cloud”. It does not rely on any facilities or equipment at your business location - and it does not require any capital expenditure to deploy. During initial configuration, your administrator determines how incoming calls will be routed on the StarRecovery system. Key employees with their own direct dial numbers can choose to receive calls on a cell phone, home phone, or simultaneously on both. Main or departmental numbers can be routed to an auto attendant, or to a group of numbers. When the primary phone system or phone lines go down, the administrator activates StarRecovery by notifying the local exchange carrier. Upon notification, the carrier reroutes calls to the StarRecovery system using Remote Call Forwarding. The StarRecovery system will then accept incoming calls in place of the company’s primary phone system. Incoming calls are automatically routed to their pre-determined destinations.